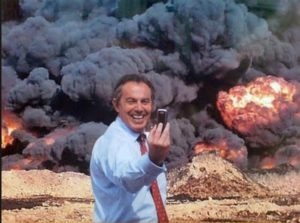 Tony Blair signed a secret contract with a Saudi oil company worth £41,000 a month and two per cent commission on any lucrative deals he helped secure, it has been claimed. The former prime minister reportedly agreed to help PetroSaudi through his company Tony Blair Associates (TBA) in November 2010, according to documents obtained by the Sunday Times. It is believed to be the first time a contract negotiated by Mr Blair since leaving office has been revealed. The work only lasted a few months. Mr Blair, who holds the diplomatic role of Middle East Peace Envoy, has faced repeated criticism in the past over his high earnings since leaving Downing Street. Middle East peace envoy! You can’t make this stuff up. His decision to send British troops into Iraq alongside America in 2003 proved highly controversial, triggering ministerial resignations at the time and becoming a defining moment in his premiership. Eh, what’s 59 beheadings and civil rights abuses between friends right? I mean, let’s be honest, what’s the point of being Prime Minister if you can’t ring the register afterward? The Hollie Greig case is currently before the courts and I would hope that Hollie and her mum Anne get their day in court as this clearly shows how a clear cut case of peodophilia can be mismanaged by the police, the judicial system and local councils. There is a close link between this case and the Dunblane Massacre and the fact that one extremely senior political figure just so happened to be in charge of NATO at the time. If we all recall the FBI provided a list of peodphiles that could be a risk to the security of the United Kingdom. This list was given to the British Prime Minister at the time (Tony Blair) who did absolutely nothing about it………could there have been a reason for this? It's a very unbelievable news that Tony Blair get paid 61,000$ per month. I heard it now. Is it really true? I think now he get paid more. It may be double. I will share this information to my family. If they believe it, i will also believe it. Thanks! !